a valuation of over $2 billion USD by 2019, and given the large potential that this sector has, there arises a need to understand challenges faced by the sector and the hurdles on the path to progress. 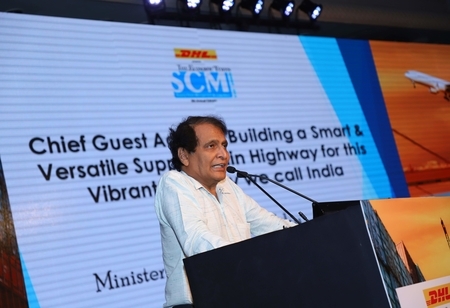 The fifth edition of The Economic Times Supply Chain Management & Logistics Summit 2017 saw Suresh Prabhu, Minister of Commerce & Industry and Civil Aviation of India, elucidate on steps taken by the government to give a fillip to the Supply Chain domain across the spectrum. Speaking at the event, he said, “Our economy is poised to grow up to $5 trillion in the next 7-8 years, and up to $10 trillion in the next 15 years. Ease of trade and doing business forms the fulcrum of the government’s proposals to increase India’s trade competitiveness, and this has direct relevance to the ‘Make in India’ campaign. There is thus a massive opportunity for the logistics industry to embark on a journey of transformative growth. Moreover, with the implementation of policies such as GST and the investments being made into various aspects of logistics like physical infrastructure and technology, there lies a significant scope to create efficiency gains that can translate into better outcomes for all across business and society.